Click here to view the map of all current bronze, gold and silver participants. In line with submission/re-submission timescales, new and re-awarded company details will be updated on a monthly basis. 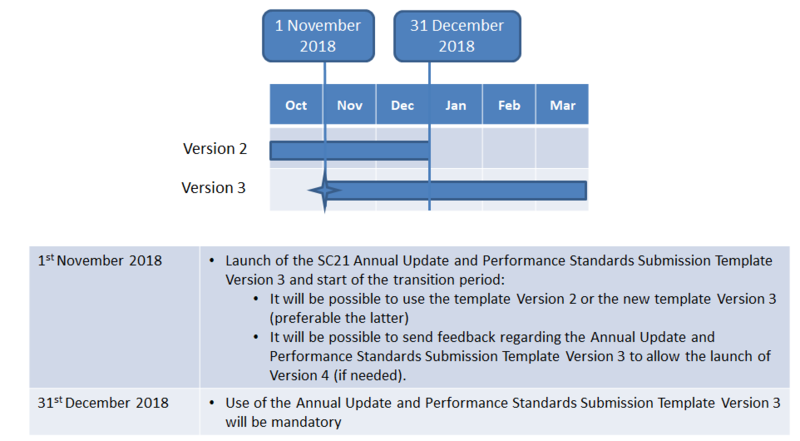 SC21 Annual Update and Performance Standard Submission Template – Version 3 (1 November 2018) – please click on the link, download the file, complete it and send it to sc21@adsgroup.org.uk. In case you are not able to open the link or to access to Dropbox, you can write an email at sc21@adsgroup.org.uk with subject “Request for latest version of SC21 Annual Update and Performance Standard Submission Template”. As part of our ongoing 2018 data collection mechanism improvements, we are now seeking for all participants to provide an annual update. We have therefore incorporated this functionality within this new version of the template. This will also enable participants to be tracked as “Active” within the SC21 National Status Report (NSR). Therefore, please use the template Version 3 to submit your annual update. Please refer the timeline below for use of the template versions. Recognition can occur only after all required of the SC21 framework elements have been proved to meet the criteria. SC21 companies have signed up to a formal recognition process which reflects the contribution and commitment of their supply chain. Organisations achieving and maintaining agreed criteria in terms of delivery, quality, sustainable improvement and the associated improvement frameworks (business, manufacturing and relationship excellence) will receive recognition in the form of a bronze, silver or gold award sponsored by an SC21 company. Implementing these four aspects of development and performance achieves a benefit to all parties in the areas of competitiveness, enhanced customer perception and lower internal costs. These reflect the exacting requirements of some of the major aerospace and defence organisations worldwide. The process to obtain the SC21 recognition: gold, silver and bronze award has been developed by the SC21 community to ensure that there is a simple standard approach to recognise that SC21 members supply chain performance are improving according to the SC21 commitments.